Whenever you see me out and about, I'm either carrying a ridiculously small bag or a ridiculously large one. While I am a big fan of my North Face backpack, it will never be the bag to tie a look together. So, on days where I am interested in functionality and style, I tend to go with one of my carryall totes. 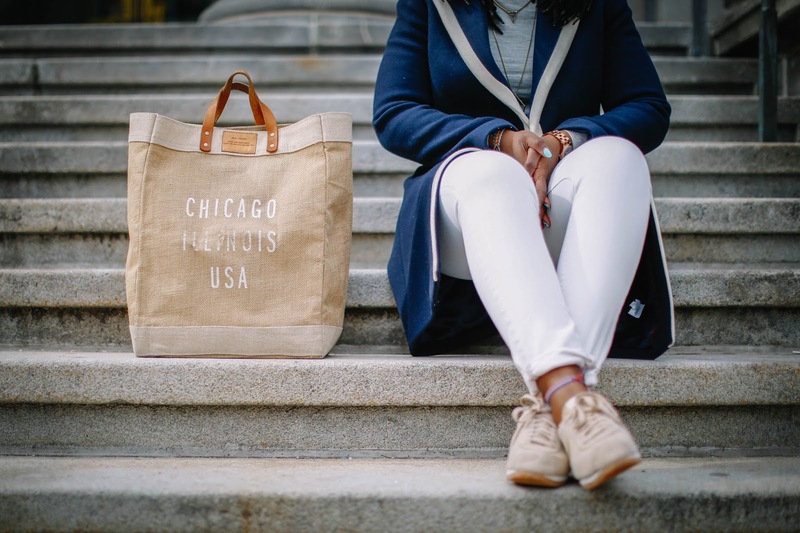 My absolute favorite tote is this one from Apolis. They have built a brand around this incredibly durable and good looking tote. I got this my first year of college for I think $70 (and that totally put a hurtin on my pocket back then), but it has been the single most used item I have ever purchased. This is my go-to grocery bag and it can fit everything ever, which is good and bad because sometimes it gets to be bit too heavy, but that's okay. The bag can hold at least 135lbs (! ), has a waterproof lining so any food spills are super easy to clean, and the artisans who make these bags receive Fair Trade wages. 10/10 would recommend. My "working-woman" tote is this one from Kate Spade. It's nothing special in terms of looks, but it's a nice, soft leather and I snagged for about $120 from the Kate Spade outlet. I can fit my laptop, notebook, lunch bag, and workout clothes in this bag. So roomy, I love it. Though black is a little dark for spring and summer, the classic silhouette makes it versatile throughout all seasons. This is my "in the office on a casual Friday and weekend tote." This one is Nike and is also so spacious. The fabric is pretty malleable, so you'd be surprised at how much you can fit in here. I've done a trip to Trader Joe's with just this bag, and all of my groceries fit and I was able to still zip it up. There is a laptop sleeve in this bag, along with some pen pockets and other pockets to keep your smaller items from getting lost. 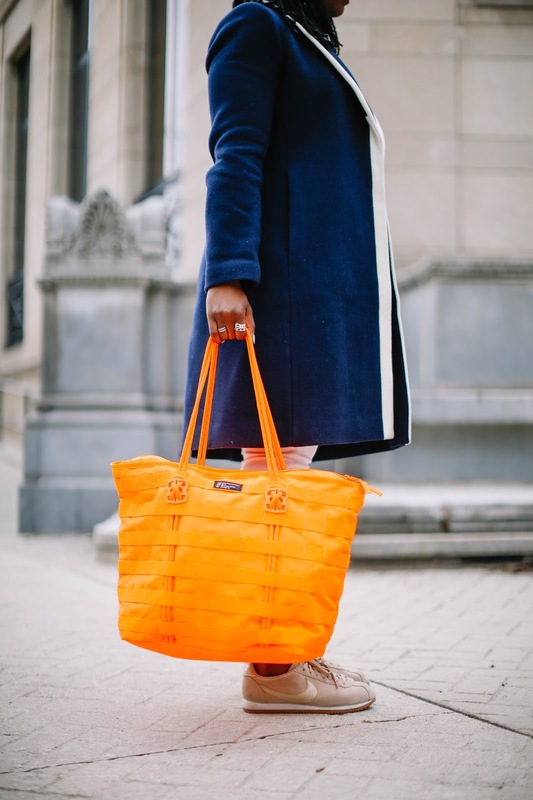 This bag comes in less bright colors, black and rattan, but I think the orange really brightens anything I have on and manages to make me look a touch cooler. 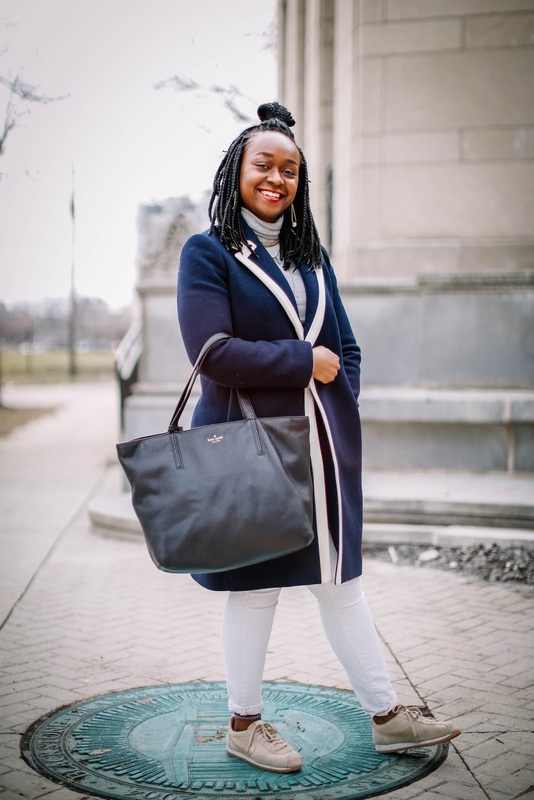 It's sporty, but still looks great with my polished coat from J.Crew -- a fun addition to the closet.